This event is part of Fiber Fest, a month-long series of fiber offerings at Lynden. For more information, click here. Thanks to the generosity of the Knitting Knook, Lynden opens its doors to the community for a February Free Family Day. Join us for our February Fiber Fest Finale, peruse our Fiber Fest photo journal, or simply enjoy Lynden's many winter pleasures. 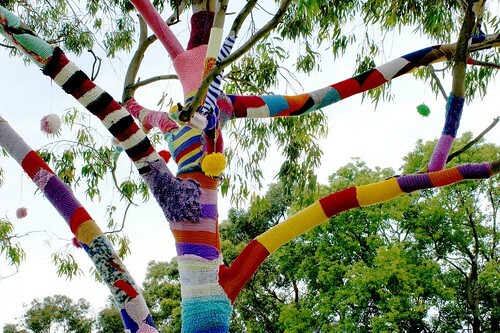 Knitters and aspiring knitters of all ages and abilities are welcome to join us for this day-long knitathon and yarnstorming (think cowls for trees). Yarn, needles, and instruction provided, but feel free to bring your own to this communal event. (If you have a small stock of yarn or some spare needles you would like to contribute, you are welcome to drop them off in advance at Lynden.) Expect some treats from Knitting Knook, including special discount coupons, patterns, and door prizes. Knitting circles, solo knitters, and neophytes all welcome. Hot cider and cookies will be provided.